Would you like to have a poem included in 2019 PST Summer Conference Anthology? Check out the Submission Requirements! Photo by Andrea S. Marshall. Announcing the launch of PST’s poetry anthology! The original thirteen chapter readers from this Summer Conference plus 41 additional poets contributed to this anthology. Among these are two past presidents of NFSPS, the current and seven past presidents of PST, eight Texas Poets Laureate and an Oklahoma Poet Laureate. While this book has been a collaboration of many hands, credit must be given to Patrick Lee Marshall, Chair of the 2013 Conference. He dedicated his time and computer expertise to this project on behalf of PST. 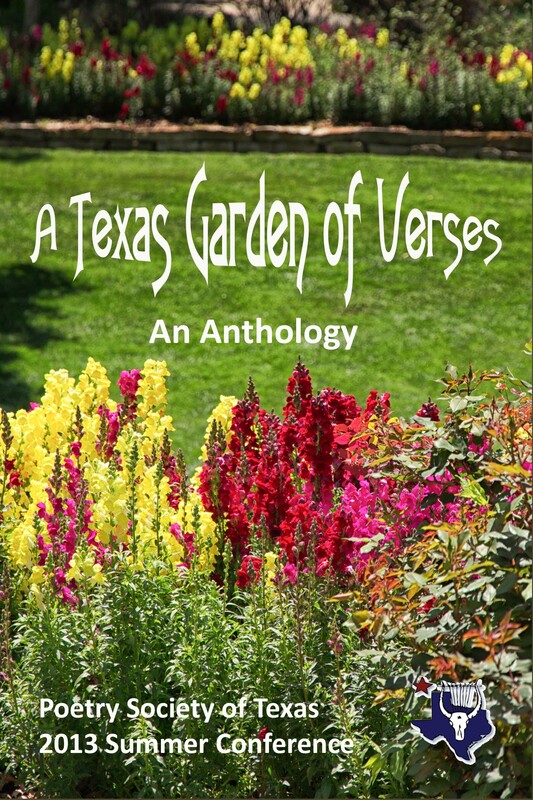 A Texas Garden of Verses is now available at www.amazon.com. You can buy it as an e-boook for only $1.99. (It can be purchased and downloaded to computer, PC/Laptop, tablet, or smart phone.) It is also available in paperback for $11.66. All proceeds benefit the Poetry Society of Texas.